There's no denying the weather has been a bit unusual. Take a look at some spectacular photos from around the world. Simply stunning! 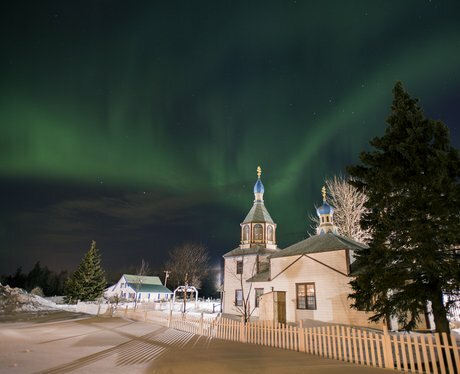 Northern lights surround a Russian Orthodox church in Alaska, USA. This rainbow's on fire in Sao Paulo, Brazil. Clouds move towards a town at sunset. A cyclist crosses a bridge enveloped in the morning fog at Sangam, the confluence of the Ganges, Yamuna and mythical Saraswati River in India. Heavy surf slams into the 72-foot-tall Ram Island Ledge Light Portland Harbor, in Portland, Maine. These icicles at Gibsons Cave in Teesdale look like they are straight out of a fairytale...a cold one! A lightning strikes the roof of a house in Alabama, USA. Eerie! The northern lights fill the sky in Kenai, Alaska, USA. No, it's not Twilight, but a stunning full moon seen against a clock tower in Kansas. Floodwater surrounds a building in downtown Vicksburg, Missouri. These northern lights look like they are dancing on top of a house in Norway. Never mind the snow, these flowers will blossom, rain or shine! The calm after the storm: the Lime Kiln at Beadnell harbour, Northumberland, is framed by sunlight and a rainbow, making it glow like gold. This lightning looks menacing above a town in Germany. Clouds darken the beautiful sunset sky over a town. Lightning streaks the sky over a church in Alabama, USA. Surfers in Brazil brave a storm. A swimmer braves the heavy rain in an open pool in Frankfurt, Germany. This thunderstorm in south east Brazil hits a beach.